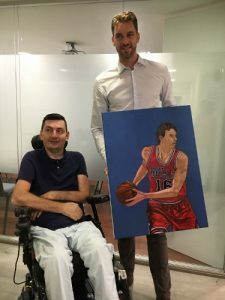 The NBA basketball player Paul Gasol visited the publishing house Spain on the occasion of the international mouth and foot painting day. Our artist Florin Anghel surprised him with a portrait of the basketball star, which the artist had painted himself. Paul Gasol shows that he is not only a great personality and a great star but also has a great heart! On Tuesday 26th September 2017 the Duke of Cambridge was the very special guest unveiling a commemorative pillar at the cenotaph known as the Milton Keynes Rose. The pillars at the Rose feature days of importance to local people and the event was to mark the 50th anniversary of the inauguration of the new town of Milton Keynes. 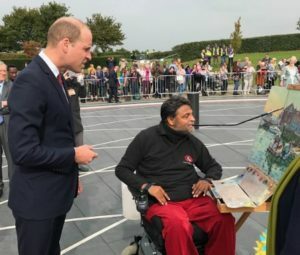 Mouth artist Keith Jansz was invited to highlight Disability Awareness Day which is celebrated every July 14th along with Valerie Williamson, one of the first British Paralympians. 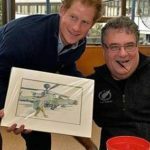 Keith chose a painting of Padstow Harbour to demonstrate his painting technique to the Prince, a nod to his father’s title of Duke of Cornwall, explaining that he is unable to use his hands to paint following paralysis due to breaking his neck in a car accident in 1995. The Prince spoke to Keith about the potential to take on new challenges and embark on a new career after such a life changing injury. Keith said: “ When he saw my painting the Prince said ‘ Wow, that’s amazing !’ He was intrigued by my ability to capture the Cornish light – a comment that thrilled me as it is what I strive to achieve in all my work. 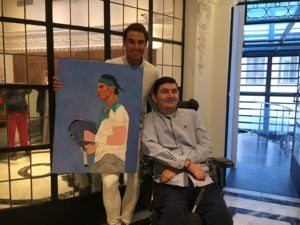 On the 11th of May 2017 the Spanish mouth-painter Florin Angel presented to the popular tennis star Rafael Nadal a portrait, which the artist himself had painted. The multiple world number one tennis player received the portrait with great joy and posted some thankful words to the artist on his personal Facebook page. In the last nine months, 55 mouth and foot painters from all over Mexico, led by publisher Raquel Hernández, have worked together on a common goal. As a gratitude for the 60th anniversary of the Association, a joint exhibition was organized in the Basilica of Santa Maria de Guadalupe, the largest Christian pilgrimage site in the world. The exhibition was opened on May 4, 2017 by Mexico’s First Lady, Mrs. Angélica Rivera Hurtado, which was a great honor for all of the 35 present mouth and foot painter.It will remain an unforgettable moment for all participating artists. A total of 57 pictures will be presented to the public until June 2017. The foundation Integracja which cares for handicapped persons celebrated its 20th anniversary in October 2014. The jubilee was marked by a major celebration which was enthusiastically covered by numerous media outlets throughout Europe. Founder Mr Piotr Pawlowski was accorded and presented with many honours for performing his services and having established his foundation. On this occasion he met various dignitaries form Europe and Poland. 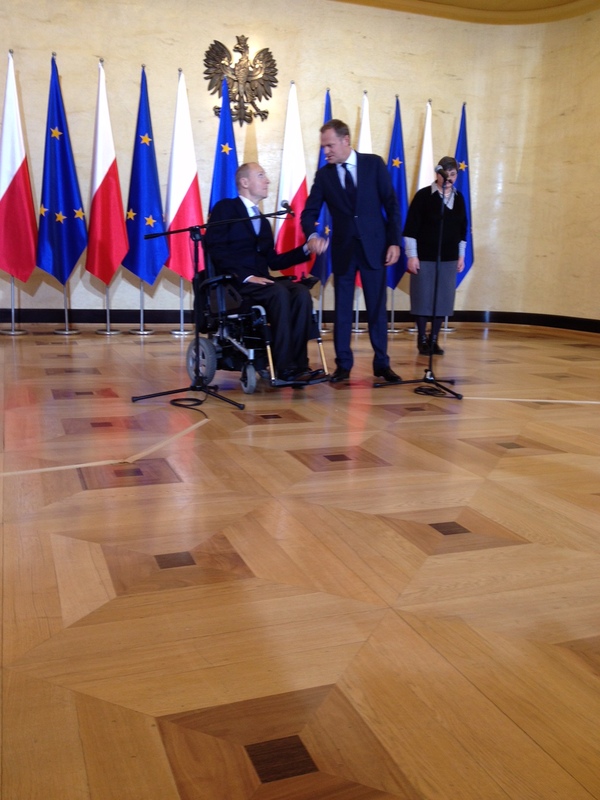 Also the president of the EU Council Mr Donald Tusk thanked the artist for his great performance. 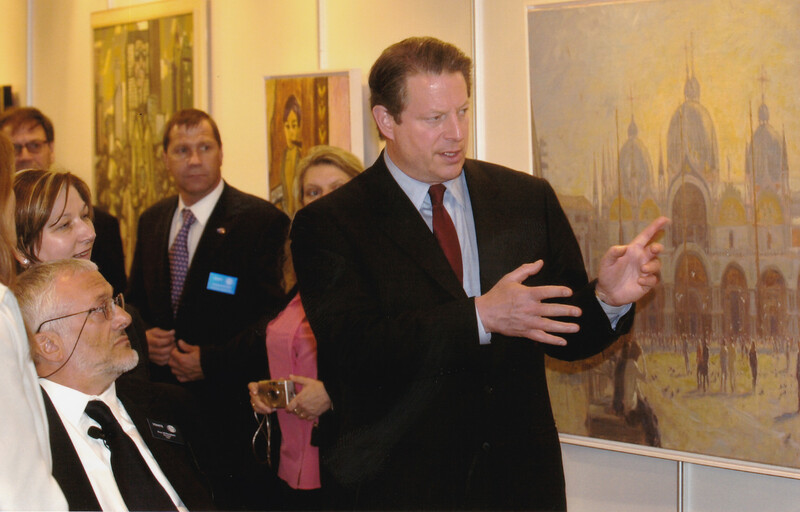 From September to October 2015 the US publisher organized a tour of exhibitions, painting demonstrations and interviews. 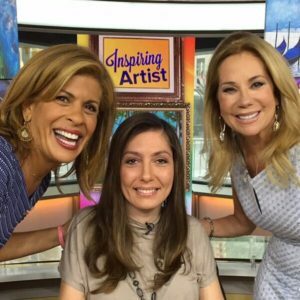 The tour led the mouth painter Mariam PARÉ to the following cities: New York, Chicago, Los Angeles, Orlando, Saint Petersburg, Vancouver and Toronto. Mariam PARÉ was supported by the following artists: Antonio DAVIS, Cynthia BERNHARDT, Christopher John KUSTER, Cody TRESIERRA, Theresa Helen MATTHIAS. 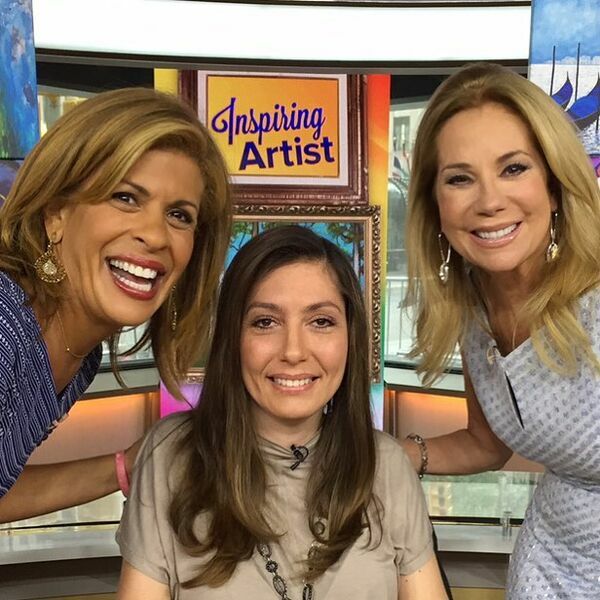 Among other things, Mariam PARÉ could present the two talk show hosts of the “Today Show” in New York with a portrait. On making their appearance in Vancouver Mariam PARÉ and Cody TRESIERRA were welcomed by the Governor of British Columbia and in Toronto Mariam and Theresa Helen MATTHIAS met the Governor of Ontario. When actor and James Bond performer Pierce Brosnan heard about our artist, he was deeply fascinated by her work and wanted to get to know the artist personally, so he invited her to his house in Malibu. During the visit, they exchanged their views on art and its importance as a form of therapy, as they have both had to overcome heavy blows of fate in their lives. 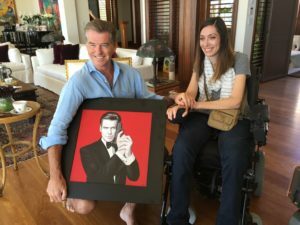 In many respects, this meeting was an encounter between two very creative people: both were inspired to paint due to a tragedy, and they bonded over their shared love of art. September 26th 2006. 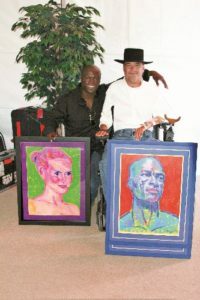 Seal gave a private concert to patients at Rancho Los Amigos Rehabilitation Center (Los Angeles). Mouthpainer Robert Thome received his rehabilitation there and is regularly involved in different activities with this institution. At that particular event, Robert Thome presented the famous singer with the portraits of him and his former wife, Heidi Klum. 54 mouth and foot painters were welcomed to this artists’ gathering. During the first two days, a workshop was held, which was divided into four parts. On both of these days, the mouth and foot painters were able to fundamentally put their knowledge and skills to the test. 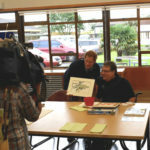 The teaching staff available gave them the opportunity to develop their skills further. Additional highlights of this week were the conference and the subsequent opening of the exhibition on Thursday. The Woodruff Art Centre, with its impressive architecture, provided a unique setting for this exhibition. The Friday was dedicated to a full-day excursion. “It is truly an honour for me to be here and speak to you. I must tell you that I have rarely felt as honoured as when I was invited by this group in order to hold a speech for opening its exhibition and one-week gathering and activities here in Atlanta. It is an honour for me to officially open the first larger international exhibition of mouth and foot artists in the USA. Many of the works of these artists have already been exhibited all over the world, but today they are having their American début here in the Atlanta, Georgia, and as you will see in the hall next door: More than 130 works of this extremely talented group of artists. I just had the privilege of already going the exhibition and am already looking forward to returning, meeting a few more artists and having a closer look at several paintings, which I have not yet discovered. I would also like to say a few words to my friends here in the USA about this group, which is ironically much better known in other countries than here in the USA. In countries like Germany, England, France and Scandinavia, this association is much more in the public eye than in the USA. Perhaps you know that the opportunity is available to purchase postcards with the picture of your choice. This is very popular in Europe and Asia and I predict that it will be even more popular in the USA. There are several things that my friends here in America don’t know about this association and particularly about its structure. It is a completely self-sustaining organisation. It has nothing to do with charity. We support all charitable purposes. This is not a charity. These artists earn their money in their own way. They pay for their cost of living and thereby help their fellow artists. They earn good money thanks to you and are proud to pay their taxes and help others. The exhibition that you will see speaks for itself. The quality of the works of art is astonishing. With the word “astonishing”, I am not referring to the technique that is used; I say the word in the same way as I would use it with artists who paint using a traditional method. The quality speaks for itself. With these works of art, you will find an extraordinarily high level of quality that – and I believe that you will agree with me – speaks for itself in detail. Benjamin Disraeli, the old English diplomat, once said that the secret to success is the consistency of the goal. If you have a goal, you know what this goal is and consistently follow it, you will have success. The consistency of this goal is what distinguishes this organisation and all of its members. You will feel the consistency of this goal when you look at these paintings. In the awareness that these paintings are painted using the mouth or foot, we see them with particular appreciation. However I would assess these paintings, regardless of the way in which they have been painted. The President of this organisation explained something to me, while we were going through the exhibition: “Actually, these paintings were not painted by mouth or foot, but with the spirit”. Michelangelo and all great artists of the past painted their pictures with their spirit and thoughts. It is an expression of human spirit that comes from inside and the medium through which a work of art is always realised. This is very obvious with the works that you will see. We celebrate the passion, the hard work and the tenacity of the artists. But I would also like to celebrate the association that binds them together. I had the opportunity today to meet the employees of the association who have worked so hard to make this organisation so successful and I know that the artists here are very proud to be part of this association. Congratulations! Several long-standing members of the association help by giving lessons to the younger members of the association and they have noted, among other things, that more output is necessary in order to inform the public about who they are, what they do and why they do it so well. I would say that this country, in my opinion, still has many outstanding items on the agenda in the area of “undiscovered talent”. Whenever I see a demonstration of the human spirit like this exhibition, I must inevitably think about my numerous fellow Americans who have the ability, but not the opportunity, to express themselves. I am unhappy about some of the recent decisions of the Supreme Court in the Disability Discrimination Act, as well as about some of the recent decisions regarding support programmes for the disabled, as the aim of these programmes and the law is to facilitate and promote the self-expression and self-realisation to which every human has a right. I think that we should take this opportunity to celebrate what has been done and achieved, but we should also use this moment to honour the unbelievable achievements of these brilliant and inspirational artists by trying to make their work even more impressive and make it possible for them to achieve even more, so that they will be able to support themselves and earn their living in their own way, so that they can again reach others over the course of time. 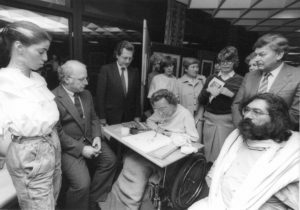 We must deal with the problems in the healthcare sector, where the members of the association require aid for the disabled, so that they can become independent, self-supporting and fully productive members of society. But finally, I would like to come back to an aspect that I already addressed at the start. After all, this is all about art. It is not about the specific technique that the artists use. It is not about the details of the association, as important as they are. It is about art at a world-class level that inspires our hearts and makes us better understand the ultimate truth, that all of us are the same. We were put on the Earth for a specific purpose and must also practise consistency in the goal of helping one another. 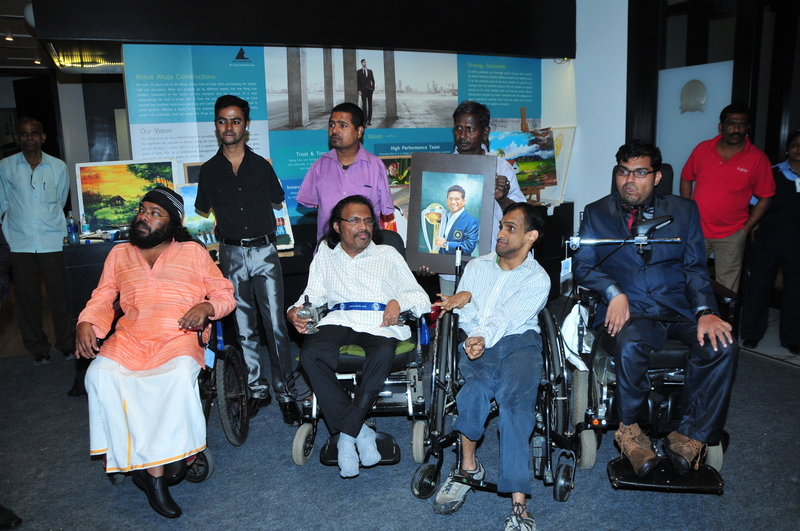 On January 17, 2015 our Indian artists Narayan RAMAKRISHNAN, Jesfer PULIKKATHODY, Ganesh KUMAR, M. V. RAVINDRAN, Bandenawaz Badhsa NADAF and Nadeem R. A. SHAIKH had a big event with various Indian celebrities. Among other things, our artists met with Rati Agnihotri (Bollywood actress), (Bollywood actress and politician), Shreya Sharan (Bollywood actress), Rehan Poncha (swimming idol), Rajat Tangri (Bollywood fashion designer). The artists demonstrated their painting skills and chatted with the stars about movies, sports and politics. 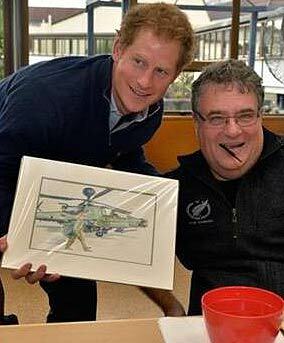 Our Member Grant Sharman gave Prince Harry a picture he had painted of the Prince standing next to an helicopter. 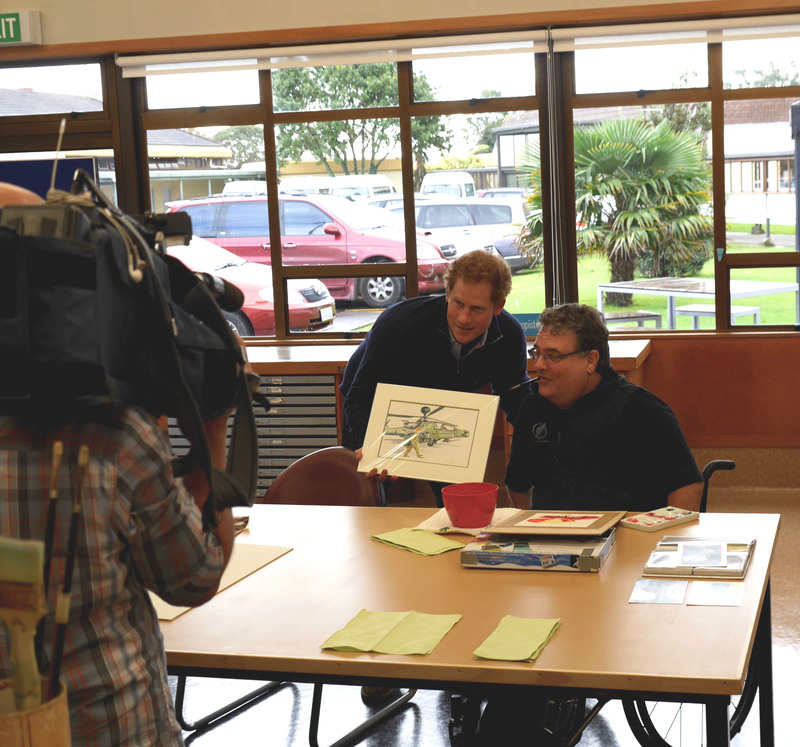 The Prince, who is patron of the Injured Players Foundation in England, had made time to visit the New Zealand Rugby Foundation as it supports severely injured rugby players and their families. Minister Dr. Norbert Blum watches the German mouth painter Irene Schricker while she is in the act of creating a sketch during an exhibition of the AMFPA at the Gustav-Heinemann-Haus in Bonn. (Germany 1984). 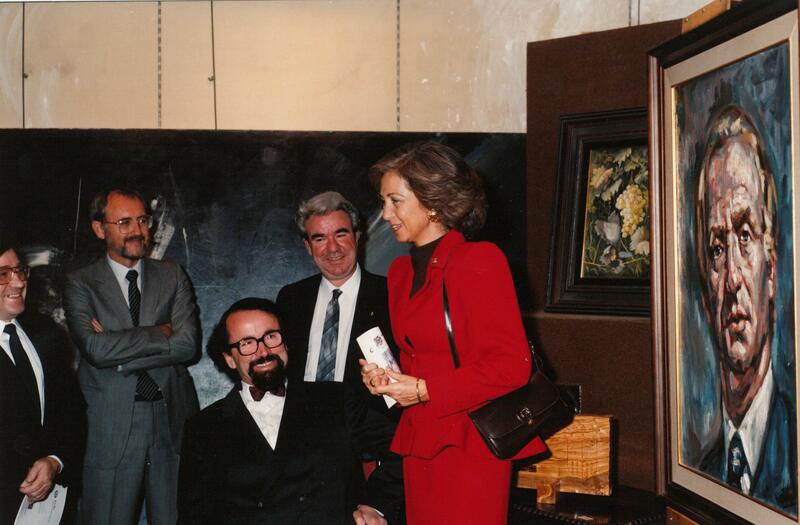 Her Highness Queen Sofia with our Spanish members Cristóbal Moreno-Toledo and Prof. Manuel Parreño 1990 in Madrid.